MDS (Meta Data Service) repository is used to move the web.xml file into the server. In the application top we will be having MDS folder. 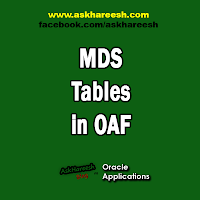 Destination paths, regions will be stored in MDS tables on deploying OAF page in server. Stores the path of the documents, OA Framework pages and their parent child relationship. Stores components on documents and OA Framework pages. Stores attributes of components on documents and OA Framework pages. Stores translated attribute values of document components or OA framework pages. This is a sequence generator table. We can manage MDS by using standard database procedures and tools.